I’m missing my friend. My dear friend who died over a year ago. And I have a gap, the kind of gap that a friend occupies and leaves. She is in my thoughts right now as I sit at the kitchen table, cleared and scrubbed ready to work on the re-design of her garden. To be asked to re-design the garden is flattering, generous and kind. It includes me. Frankly it is also painful. Everywhere I look I see her. I see her in the past. I didn’t expect to not see her in my future. Looking in the now I see her husband floundering in grief, unsure of his new space in the world without her. Her life partner has reached out to a friend. To help him find a new life in the garden. The task is hauntingly dauntingly beautiful. I step outside of my immediate emotions, listen to the stories, the halting words, the unfinished sentences and take snippets and ideas with me to the blank sheet of paper that will be a new garden. Waiting for the first lines and ideas to emerge from the shaky pencil I tentatively map the “as is” layout, the basics, the garden raw and unadorned. Slowly I sketch the outlines, I work out the ratios and map the key points. I look away from the paper and rough lines and see the issues of the garden – long and narrow, an incline to the bottom. overgrown and too many trees, a path that follows the exact line of the fence. I see the bigger problems too – the loss of a loved one, the need to reclaim a space and yet acknowledge the passing and of memories. I close my eyes and imagine the new, the place, the people, the plants, and I struggle. I can’t see into the future anymore than the next person. I can only see the now. I can only draw the present. More talk. More measuring. More photos. More staring out – eyes wandering from brick wall to fence post and back again. My eyes need a rest from the garden and the memories it has and I look over the rooftops and out to sea. Anywhere to not look at the garden. Looking at the plants, I know the stories behind the plants in pots. I know and see the gardener. I keep looking and all I see is my friend. My beautiful friend, She’s there in my mind’s eye. The smile, the love and the laughter. She was the gardener, the designer, author, activist and presenter. And so much more. A friend. And what am I? I’m the pupil. The wannabe. The wannabe gardener, designer, author. Things so impossibly precious to me and there she was with all the experience under her wellies. I can’t step into her metaphorical wellies, I don’t want to and besides she took a much bigger boot size! It’s a privilege to re-design something so special. Her project. 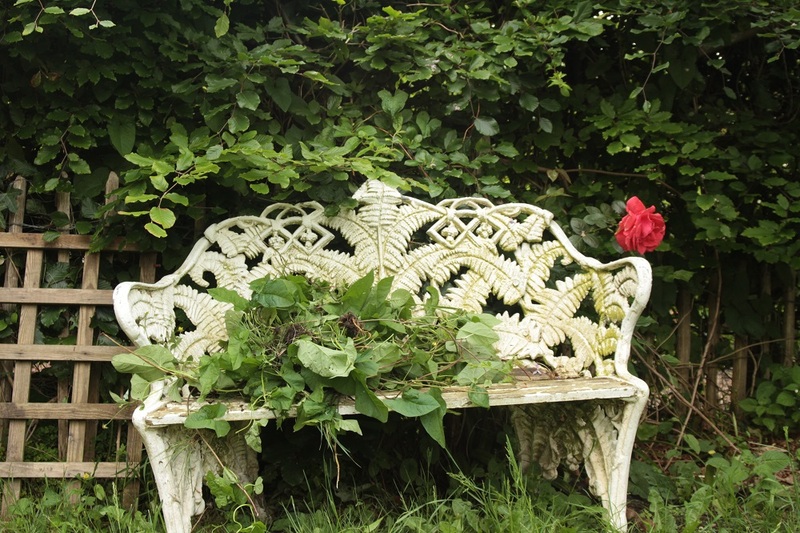 A garden that once had plans and grand designs, a shared dream. And as friends we shared that dream too.And now we have to recreate, re-fashion and re-dream. To dream of new dreams. As the garden plan takes shape there are moments of excitement in the new and tantalising glimpses of the future garden. The initial ideas are well received. I can see the layout and share my thinking. But the ideas focus on the physical layout – the place and the space if you will. The greatest challenges are still around the corner. To find not just the plants to fill the gaps but to fill the loss. There will come a time when we rip out some of the old, dig up the unwanted and build the new. And I wonder will there be tears or cheers? That won’t be for a while yet, but by being included in the re-design of the garden I can grieve. And I can dream. I wrote this article last year, but bottled it when it came to clicking on the publish button. Here goes…..
Oh Claire, what a brave, sad, beautiful post. What a tough thing you have been asked to do, but also what a privilege to be included in what will become a wonderful memorial to your friend’s life. I am sure there will be echoes of the past as well as hopes for the future in whatever you do. Stay strong but also allow yourself to grieve as well as remembering happy times. Claire, sending healing love and hugs your way. Such a beautiful tribute to your dear friend. What a tremendous honour to everything she meant to you. Very, very beautiful. Thank you Karen…. I’m hoping weeds are beautiful too!!! So many tears to water this dream. So much loss to turn over and cover the roots of seedlings. The hard work of grief memorialized along with your dear friends life. We are asked to breathe, sometimes, when the very breath within us is a struggle and pain filled moment. Such a moving account – I read it with a lump in my throat. What a lovely opportunity to pay a lasting tribute to your friend – may the results bring you both happiness and peace of mind…. if not straightaway then eventually! How did the garden design go? I hope you found solace in doing it? HI Claire .. so sorry that you have lost your good friend. Your words are indeed a tribute to her and this must have been very painful for you to write this. Sending you warm hugs to give you some comfort. The lump in my throat at the emotions in your words is bottling any reply that may properly transfer the thoughts in my head to the words on your screen. There is no better memorial than a garden and no better solace for grief than gardening. I think I’m pleased I finally pressed the publish button. It’ snot closure, I don’t believe in that but it eases me in to the next stages, whatever they are and wherever they are. and you are so right about the death of a friend being complicated – we chose them (unlike some family members!!! ), but I guess I was ucky to be surrounded by other great friends. I’m glad you clicked the button Claire. This post was written beautifully. And I can’t think of a better way to honour the memory of your dear friend than to put your thoughts and energy into replanning her garden. I hope it has brought you some solace. To create a new garden space out of your friend’s dream that celebrates her life but sustains and nurtures her husband in his days without her must be a monumental task. I know you’ll honour her memory with your plan. All the best. It’s astonishing how life changing losing a close friend can be. I’ve lost two now, and years on, it still impacts on me. So much sadness, so much introspection, but hopefully eventually growth and peace and celebration in a life lived gloriously well. She must have been truly wonderful to be missed so much. Your garden – your plural, as in hers and yours – will be so many things – cathartic, bittersweet, respectful, beautiful and hopefully it will bring peace and comfort to those who loved your friend so dearly. Oh Celia I’m sorry to hear about the loss of your friends. We choose our friends, and in some ways I think that makes it all the more harder, that gap they leave…. I am so pleased you published this moving post. Voluptuous with emotion and precious with memories, it is a beautiful post. Your heart will tell you where to go and what to do . . . allow it the liberty . . .
A loving tribute. A living tribute. Cried a little. I weep with you for your loss, and rejoice in the great muse and friend who helped to shape you into the most worthy of caretakers to follow in her well-trod path to continue what she, as a superb gardener, surely knew would grow, decay, evolve, change, and continue long past her tenure as its tender guide. What I’ve learned of loss is that the grief and unsettled business never leave me entirely, but they can fall back to more manageable places where the good and beautiful that made the death or separation so agonizing can come back into focus as the constant sorrow is put in its place in a receding past as well. Your post has sown the good seeds of loving remembrance among us all, and that will bloom as meaningfully as any plant you and your friend’s husband can grow in the new, the now. Hello Kathryn. Grief is so personal and yet so universal – a conundrum there for us. I don’t believe in closure but I do find ease eventually. And as you say sometimes those memories, the loss itself come back into ficus, but I also know that the happy times and memories also come back into focus too – I guess we can’t have one without the other. What an honor your friend’s husband has bestowed on you. The garden that you will recreate for him in memory of her will be special to you both. Remain bound by the garden – alive and comforting. Claire, I know exactly where you are. One of my very closest friends died almost 8 years ago and there is not a day that passes that I don’t think of her. I can do it without sadness now because I am so glad to have had her in my life. Your post is a beautiful tribute. Claire what a special invitation! To work on a dear friends garden. The memories must be at times devastating and at times wonderfully fun. A good friend is the best we can hope for and when death intervenes it is like part of you is missing. I do not look forward to this day for myself, nor for my longtime good friends. Wonderful post and please send pics when you are working on this project. Very thought provoking. Truly a generous tribute to your friend and your friendship, as well as a gift to her husband. I hope we get to see some pictures when the growing season starts. You’ve done a very good thing, Claire. So sorry for your loss. What a good friend you (still) are to take on this project. The difficulties of starting will (one day) be transformed and you will be left with a living tribute. And healing dirt under your fingernails.